This is the warm-up sheet that I use in my classroom. 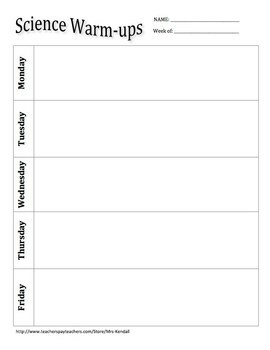 It has a space for each weekday and a reminder at the top for students to springboard their answers. Daily warm-ups are a great way to check in with your students at the start of each class and assess where they are academically as well as a way for them to understand where they are at in their understanding of a subject/concept.